An Introduction to the Book Review, by Elio. Roberto, my partner in blog, and Scott Chimileski, a member of his lab, have written a book on microbes. Because this is a bit too close for comfort, I will be uncharacteristically quiet. Instead I have asked an outsider to review it. Brian Barry is an educated layman, at least when it comes to microbiology. He fits the bill of the reader for whom this book is intended. A few days ago, my neighbor Elio came by and gave me a newly published book, "Life at the Edge of Sight" by Scott Chimileski and Roberto Kolter. He said that I might like it because it has a lot of pictures. After I thanked him, he continued somewhat slyly, "Let me know what you think after you've finished reading it." Left unsaid was the fact that I had just been enlisted in an experiment designed to learn whether someone largely ig­­­norant of microbiology would enjoy this book. Not awa­re of my true role, I read the book over the next two days and reported the results to Elio: I liked it a lot. "Great," he said, "that was what I was trying to learn. Now, how about writing a book review?" So, Elio's actual purpose was re­vealed, and here we are. "Life at the Edge of Sight" has an unusual structure. It com­prises seven chapters, each a wide-ranging story illus­trat­ing an important biological principle. The stories run the gamut – from the origins of life on Earth, to a trip by a mi­niature person through a hunk of blue cheese, to the pos­sibility of extraterrestrial life. The stories unfold using a tight integration of text and photographs – and, as Elio told me, there are lots of photographs. Most science books (as opposed to books about art or pho­tography) illustrate the text using graphics. Graphics provide much greater flexibility than do pho­tographs – you can make a graphic look like anything you need. "Life at the Edge of Sight" accom­plishes the same end using only photographs. It is worth reading this book if for no reason other than to see how Chimileski and Kolter make this technique work. Chapter 5, "Tales of Symbiosis," is typical of their approach. As the chapter begins we learn how a medicine woman in the Amazon rainforest used leaf cutter ants to clean wounds. We follow the leaf cutter ants to their nests and learn about their dependence on bacteria to remove invasive species from their fungus farms. The story gets more complicated as additional species are intro­duced, ending with a description of a five-species symbiotic network. 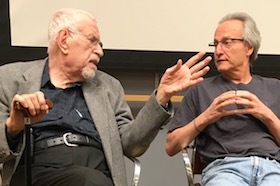 But, we're not through with symbiosis yet, because Chapter 5 smoothly segues to the lab of Albert Schatz and Selman Waksman and the discovery of an antibiotic effective against tuberculosis. Af­ter a detour for a bit of scientific back-stabbing and Nobel Prize gossip, the chapter describes re­sis­tance and why it is less likely to develop in leaf cutter ant nests than in hospitals. The ants have a more robust antibiotics strategy than we do. The chapter finishes with descriptions of bioluminescent bacteria in fish and the symbiotic relation­ship between coral and Symbiodinium (zooxanthella) cells in the Great Barrier Reef. It is a long trip from folk medicine in the Amazon to the Great Barrier Reef, but each stop along the way raises im­portant issues related to symbiosis, and does so in a fast-paced and continuously interesting man­ner. Getting back to the photographs. The authors use photos taken at a wide range of scales, from sa­tellite images to electron microscopy, all of them interesting and many of them quite beautiful. The tight integration of text and photography makes me wonder which came first. Did Chimileski and Kolter have the photographs and decide to build a story around them? Or, did they start with a sto­ry and then locate exactly the right photographs to illustrate it? However they did it, they made the technique work. I've read a lot of books written by scientists for 'interested laymen.' "Life at the Edge of Sight" holds up well in the company of authors such as Jared Diamond, E.O. Wilson, Thomas Eisner, Richard Dawkins, Thomas Seeley, and Bernd Heinrich. If you are a microbiologist and want to explain the excitement of your field to friends, relatives, or maybe the teenager living next door, I recommend that you add copies of "Life at the Edge of Sight" to your Christmas lists. It will tell the story for you. It is an amazing bargain – only $23 on Amazon. A final word of caution: When dealing with Elio be aware that what might seem to be a normal so­cial interaction could actually be a set-up. You may be getting enlisted as the subject of a skill­fully disguised experiment. Brian Barry was in the Navy’s nuclear power program – where he en­coun­tered few bugs.